Hi Mr.Reece if you go on your blog can you respond to this??????????? This year I am in Mr Penners class room which is 8-16. I am doing very well and I had a great summer how about you??????????? Convert these two sentences into algebraic using the above formula. Sentence 1: Scott is 2 years older than Donald who turns 12 on June 21st 2006. Write this sentence in the format of mx + b = y, then convert it into an expression which allows us to figure out the age of Scott. Scott is 13 years old and Donald will be 12 years old. Sentence 2: Elizabeth has $200 in her savings account. She makes $40 every two weeks babysitting for her next door neighbours. 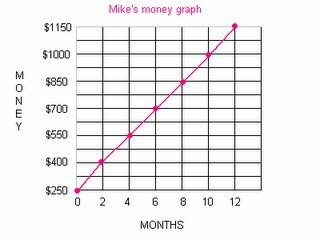 If Elizabeth saves all of her money solve for how much money she will have in one year? 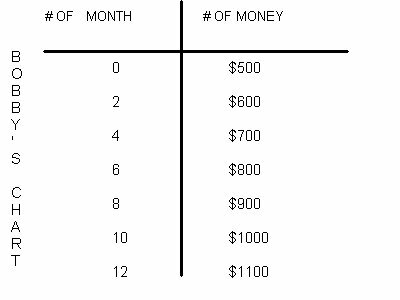 Elizabeth will have a total of $1160 in one year. Question 2: Creation. You need to create two questions for your classmates that cover different concepts (ex: T-charts, patterns, equations, graphs etc.) that you have learned in this unit on Algebra. You then need to show how to solve the questions. Your mark will be based upon the lvl of question's difficulty, and the effort put into your answer. 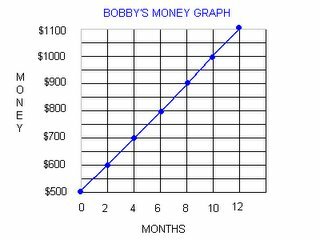 Bobby has $500 dollars in his bank account and he earns $50 every month. His friend John has $250 in his bank account and he earns $75 every month. 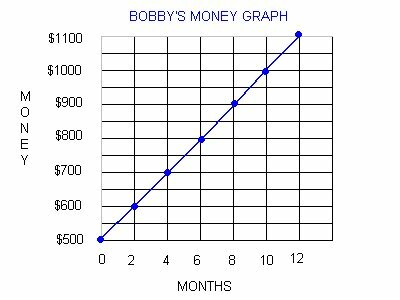 How much will Bobby and John have in their bank account in one year and who will have the most amount of money? Bobby will have a total of $1100 and John will have a total of $1150 and John will have $50 more than Bobby. One day, Sandy and Lina decided to save money and buy a walkman for $150 and share it with each other since they were sisters. 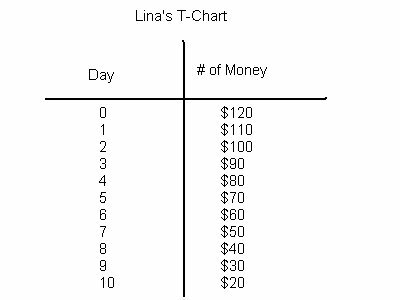 Sandy had $60 in her bank account and she would add $10 everyday for 10 days while Lina had $120 in her bank account but she would spend $10 everyday for herself for 10 days. 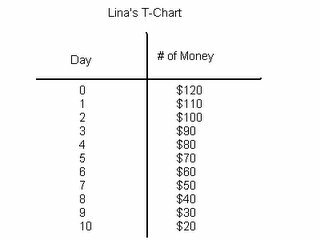 On the 10th day, will Lina and Sandy have enough money to buy the $150 walkman and have leftover money? Or will they have to save more to buy a walkman? 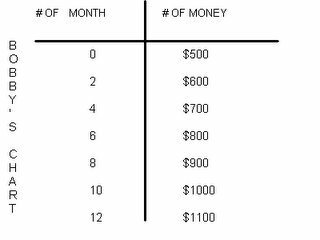 Sandy and Lina will have enough money in total to buy the $150 walkman and have $40 leftover. Question 3: Reflection. 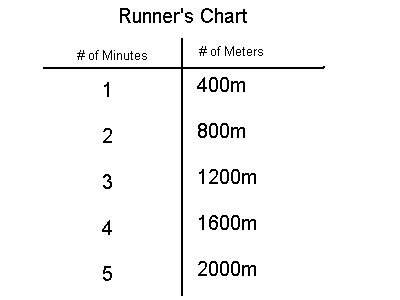 You need to look back at the chart that we filled out during the first day of the unit. This is the chart where you coloured a topic red, yellow or green. You now need to pick one concept that you coloured yellow or red and reflect in words what new skill/idea that you have learned on this topic. Can I use my words to create an algebraic formula? I coloured this in red because I didn't know how to create a algebraic formula. So if I didn't know how to make one, I would probably not be able to make one from a T-Chart or use an algebraic formula to solve for an unknown. It was easier to make a formula when Mr.Reece had taught us how and it was helping me solve an unknown and make a formula by using a T-Chart. Question 4: Preparing for the final exam. You need to think about the year that has past in mathematics and decide which topic is your weakest, and what you need to learn duriong class review in order to prepare yourself for the final exam. 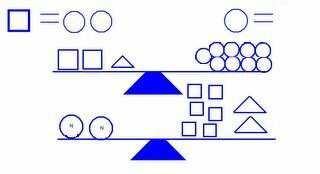 It is not enough to say fractions, instead pick your weakest area of fractions, say the subtraction or fractions, and give an example of what you don't understand. Question 1: Formulas. We've learned how to write algebraic equations in the form of mx+b=y. Convert these two sentences into algebraic equations using the above formula. Sentence 1: Scott is 2 years older than Donald who turns 12 on June 21st 2006. Write this sentence in the format mx+b=y, then convert it into an expression which allows us to figure out the age of Scott. Sentence 2: Elizabeth has $200 in her savings account. She makes $40 every two weeks babysitting for her next door neighbours. If Elizabeth saves all of her money solve for how much money she will have in one year. Question 2: Creation. 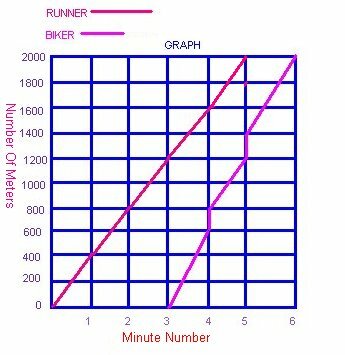 You need to create two questions for your classmates that cover different concepts (ex: T-Charts, patterns, equations, graphs etc.) that you have learned in this unit on Algebra. You then need to show how to solve the questions. Your mark will be based upon the level of questions difficulty, and the effort put into your answer. There are 500 chocolate muffins for sale at the bake sale. If there were 50 customers and the each got the same amount how many muffins did each customer get? There are 12 dentists and 48 toothbrushes. How many toothbrushes does each dentist get? Question 3: Reflection. 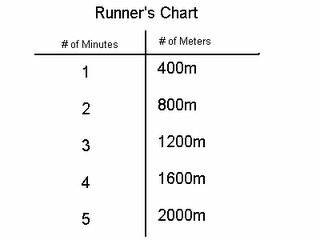 You need to look back at the chart that we filled out during the first day of the unit. This is the chart where you coloured a topic red. yellow or green. You now need to pick one concept that you coloured yellow or red and reflect in words what new skill/idea you have learned on this topic. 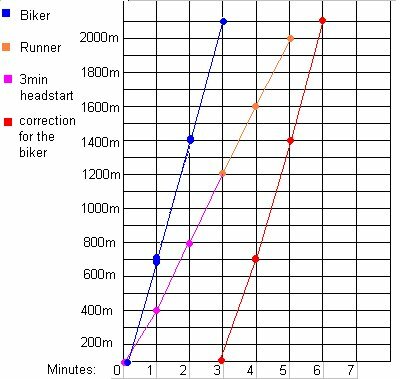 Can I create a T-Chart for my pattern? This topic I coloured red because I did not get how to do that. Now I can easily do that because it is really easy now that I know what I am doing. 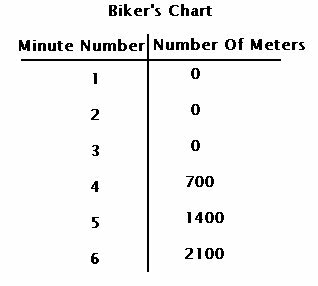 I learned that you can solve a pattern by using a T-Chart. Question 4: Preparing for the final exam. You need to think about the year that has past in mathematics and decide which topic is your weakest, and what you need to learn during class reveiw in order to prepare yourself for the final exam. It is not enough to say fractions, instead pick your weakest area of fractions, say the subtraction of fractions, and give an example of what you don't understand. My weakest topic is fractions. Inside fractions I have trouble multipling fractions. I have always had trouble with fractions. 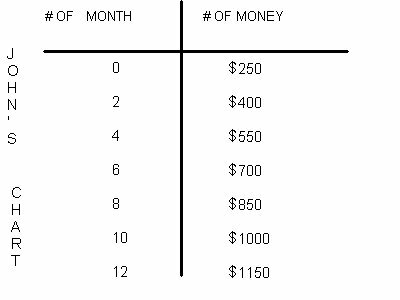 Elizabeth will have $5240 in her acount at the end of the year. 2. There are 156 cookies in a jar and Heather ate 4 a day. How many cookies would be left in the jar at the end of the month which has 30 days? There are 20 Police Officers and 5 dozen doughnuts. How many doughnuts were left for the next day? 3. Can I use my words to create an Algebraic Formula? I coloured this topic red because at the begining of the year I didn't understand how to do it. Now I can make an Algebraic Formula with words and it will make sence. 4. 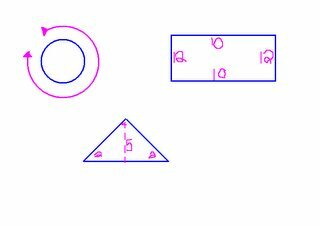 My weakest topic in math is doing Area and Circumference of a Circle, Triangle and Rectangle. I have trouble getting the answers for them. mx + b = y. Convert these two sentences into algebraic equations using the above formula. Sentence 1. Scott is 2 years older than Donald who turns 12 on June 21st 2006. Write this sentence in the format of mx + b = y, then convert it into an expression which allows us to figure out the age of Scott. N + 2 = 13 N = 11 which is Donalds age since he has not yet turned 12. Sentence 2. Elizabeth has $200 in her savings account. She makes $40 every two weeks babysitting for her next door neighbours. 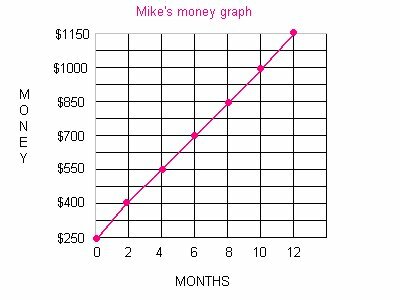 If Elizabeth saves all of her money solve for how much money she will have in one year? Question 2: Creation. You need to create two questions for your classmates that cover different concepts (ex: T-Charts, patterns, equations, graphs etc.) that you have learned in this unit on Algebra. You then need to show how to solve the questions. Your mark will be based upon the level of question’s difficulty, and the effort put into your answer. Question 4: Preparing for the final exam. You need to think about the year that has past in mathematics and decide which topic is your weakest, and what you need to learn during class review in order to prepare yourself for the final exam. It is not enough to say fractions, instead pick your weakest area of fractions, say the subtraction of fractions, and give an example of what you don’t understand. Question 1: What is the difference between an algerbraic expression and an equation (Hint: One contains this and the other doesn't)? Give an example of both an expression and an equation. An Algebraic expression is when you combine numbers, operatives, and/or free variables and bound variables. You get to choose the variable in an algebraic expression. An example: 5A X 6. In Algebraic equation, the variable is already given. There are two types of equations (from my knowledge), one step; 3E - 6 = 9, and two step; 3N = 1N +10. An example of an equation; 3H - 5 = 10. H = 5. Variables are letters that represent the unknown, able to change. Variables are often contrasted with constants, which are known and unchangning. We use variables because Algebra is a method of finding the unknown. To solve the first question, you need to figure out what a triangle equals on the first scale. First, take away four circles (each square equals two circles), which leaves five circles. Since there were five circles left, the triangle equals five circles. To solve the second question, you need to figure out the value of the two N's. First, add the squares and triangles together. The total of the squares and triangles, together, was 22 circles. Then divide the 22 circles by 2. The answer was 11. Each N equals 11 circles. The runner will finish in five minutes, the bicyclist will finish in six minutes, therefore the runner winning. What is a variable and why do we use one in algebra. I need to solve how much the triangular equals to solve the question. After that, I need to solve how much the 2 N's equal to. 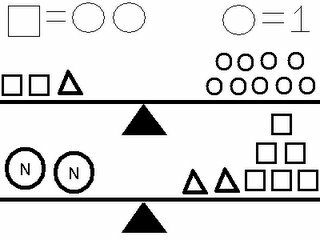 Solving for first scale: Since a square means 2 circles and a circle means 1, and the left side of the scale in this diagram has 2 squares, that means 4 circles or 4 in all. So I take 4 circles away from the right hand of the scale, I will end up having only 5 circles left and a triangle. So that means a triangle is equal to 5 circles. 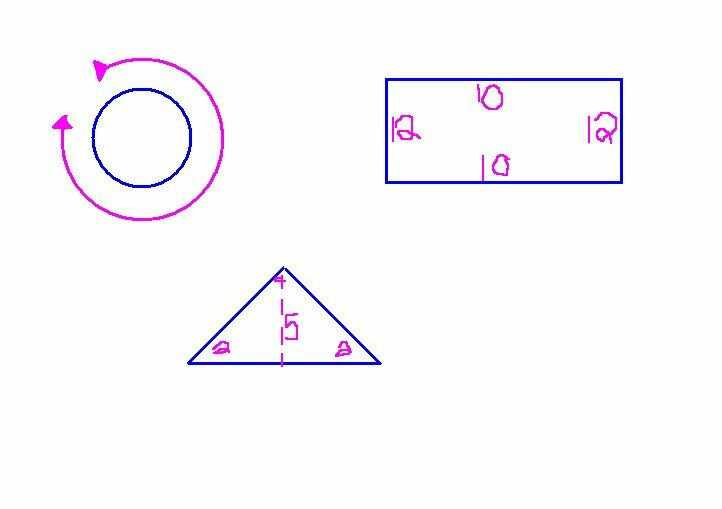 Solving for second scale: Since I have already solved the value of the triangle and I know what the value of the circle and the square is, I will be able to solve the value of the 2 N's easily. First I would have to add all the squares and triangles on the right hand of the scale, and it would come out of a total of 22 circles or 22 (since a triangle represents 5 circles and a square represents 2 circles.) Now I will have to divide the number 22 in half (because there are 2 Ns) and I will get 11. So the value of each N will be 11. The total value of both Ns is 22 circles. Solve the following equations. Show all of the steps that are needed. Question 5. 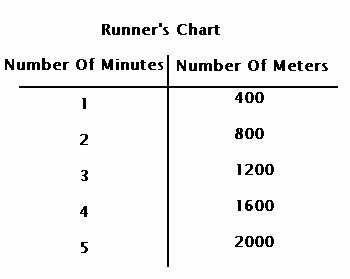 For this question you need to create a T-chart and a graph to plot your data from this question onto. 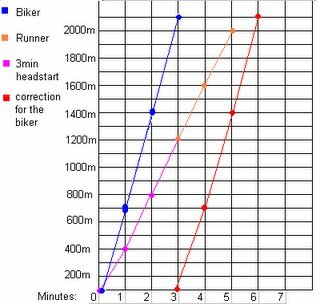 You are having a race against your friend, except you are on foot and he is on his bike. You both know that if you are on bike you will be faster so your friend gives you a head start of 3 minutes. 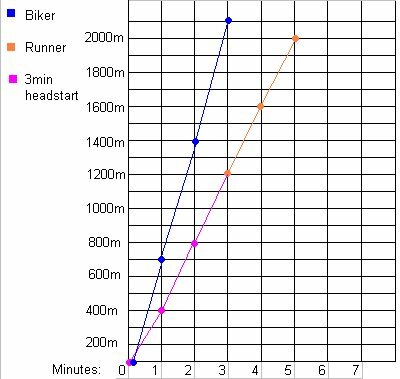 If you can run 400m per minute, and your friend can bike 700m per minute, who will be the first one to make it to the finish line 2000m away? 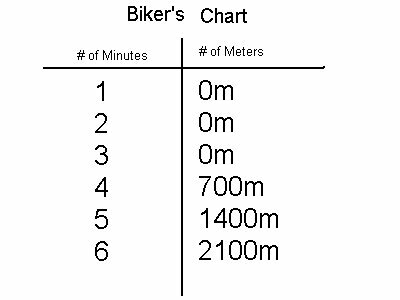 The runner will come in first in 5 minutes and the biker will come in second in about 6 minutes.